The outstanding success of our release of Bach’s Cello Suites performed by Janos Starker has encouraged us to follow this up with a no less important interpretation of Dvorak’s Cello Concerto by the Hungarian virtuoso. Starker tackles this concerto with amazing confidence; technical difficulties encountered by others in its performance appear unknown to him. Tonal purity, even in the dreaded upper register and the cadenzas, remains unscathed, so that one can concentrate wholly on the meditative magic of the music. 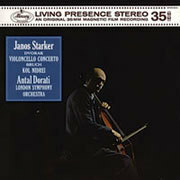 Janos Starker has found worthy fellow musicians in Antal Dorati and the London Symphony Orchestra. The conductor and soloist set a benchmark in how to work together as a team in concert in that it is less the often-lamented emulation than the interpretation, which stands in the foreground in this performance. Rather, the two protagonists commit themselves to a chamber-music-like reading, which is distinguished by the dynamically moderate intonation of the orchestra and the slender tone of the soloist throughout. An ever-welcome encore is found on side two with Bruch’s Kol Nidrei, performed with verve and a good portion of romantic, melting sweetness, which allows this evergreen to flourish.